Assessing photos isn’t the most titillating task on the planet, but it’s mission critical if you ever want to find certain photos in your expanding collection. Happily, most photo management apps—including iPhoto, Aperture, Adobe Photoshop Lightroom, Adobe Bridge—provide you with myriad marking methods such as flags, keywords, colored labels, and star-rating systems. Even with these helpers, developing an easy-to-use assessment strategy is tough, and while a star rating system can be efficient, you can quickly run into trouble. For example, let’s say you look through imported photos and find a great shot so you give it three stars. You keep perusing photos and find an even better shot, so you give it three stars and then you backtrack to find the previous three-star shot and give it 2 stars instead. Repeat this time-consuming horror for an hour and you’ll vow never to use star ratings again. In fact, Photos for OS X, which replaces iPhoto and Aperture this spring, ditches star ratings for favorites, just like Photos for iOS. Until then, here’s one possible solution to such star-rating madness: Give all the keepers a 1-star rating, filter the photos so you see only the 1-starred shots and then reassess from there, adding a 2-star rating to the best ones. When you’re finished, filter the photos so you’re seeing only the no star or 1-star shots, select them, and delete them en masse. 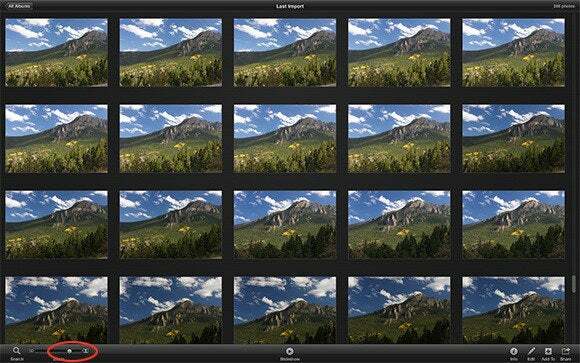 Here’s how that might go in iPhoto, though you can easily use similar steps in other apps. As soon as you import photos, click Last Import in the Source list. (If you’re way past the point of import, choose an event or a date in Photos view.) Turn on star ratings by choosing View > Ratings or by pressing Shift-Command-R. Enter Full Screen view by clicking the green maximize button at upper-left of the iPhoto window or by pressing Control-Command-F.
Next, adjust the Zoom slider in the iPhoto toolbar so you can see at least five thumbnails to a row (try seven if you’ve got a wide display). That’s big enough to determine whether each photo is a keeper, but not so big that you get distracted and (gasp) enter Edit mode, where you’ll spend 30 minutes messing with a shot that may not be the best of the bunch. The Zoom slider (circled) lets you determine thumbnail size, which controls how many photos appear per row (shown here in full screen view). Now, make your first pass through the photos, Command-clicking the thumbnails of all the keepers. Give them all a 1-star rating by pressing Command–1. Next, click the Search icon at the lower-left of the iPhoto toolbar. In the field that appears, click the tiny magnifying glass and from the resulting menu, choose Rating and then click one star. You should now see only photos from the last import (or whatever event you’re in) that have a 1-star rating or higher. Once you click Rating in the search menu (left), the search field changes to stars (right). To see just the 1-star shots, click the first star circled here. 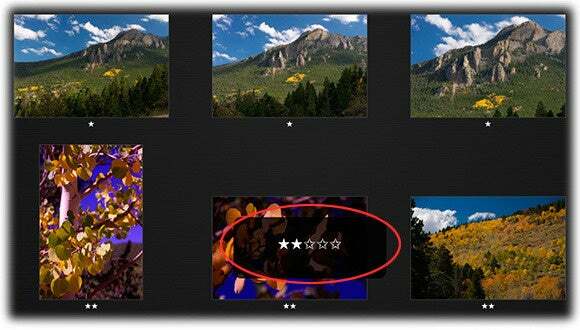 Make a second pass through the photos and assign a 2-star rating to those deserving. As you go, click the flag icons—or press Command-period (. )—to flag the 2-star photos that you want to do something special with (say, post on Twitter or Facebook, add to your blog, include in a photo book, turn into a black-and-white, or whatever). 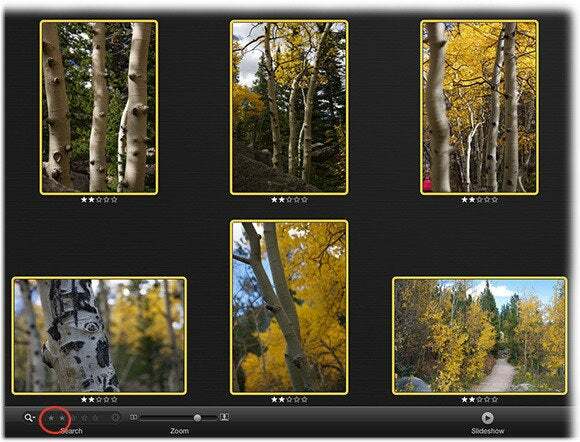 Use the Search field at lower-left of iPhoto’s toolbar to see only those photos with a rating of two stars or higher. Press Command-A to select all the 2-starred shots and then press Command-N to plop them into a new album (you can always continue your assessment within the album). At the top of your screen, click the album’s name (untitled) and enter something meaningful. When you’re finished with your second pass, turn on two stars in the search field to see just the 2-starred shots (shown here selected and ready to be plopped into a new album). Next, pick Ascending in that same menu so the unrated thumbnails appear at the top and the highest-rated photos appear at the bottom. Click to select the first thumbnail at the top of the photo-viewing area, and then drag the scroll bar downward until you see the last 1-star photo. With informational overlays turned on (choose iPhoto > Preferences > Appearance and check the box for “Show informational overlays”), you’ll know the instant you scroll into multi-starred photo territory. The informational overlay (circled) appears only after turning it on in Preferences and while you’re pressing your mouse button to drag iPhoto’s scroll bar. Shift-click to select the last 1-star photo, as well as all thumbnails in between. At this point, only photos with no stars or a 1-star rating should be selected. 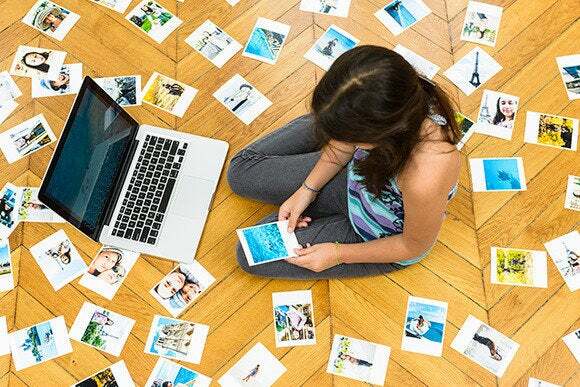 Steel yourself and press the Delete key on your keyboard—iPhoto will tuck the rejected photos into its Trash folder, where they await permanent deletion (you still have to choose iPhoto > Empty iPhoto Trash to get rid of them). That’s all there is to it! Again, this strategy works in any program with a star-rating system, though you may need to root around to find filtering controls. Having an assessment strategy like this goes a long way toward keeping your photo library manageable. And if nothing else, it’s a great starting point for creating an assessment strategy of your own. After all, the more you use it, the more you’ll be able to tweak this strategy to your liking. Until next time, may the creative force be with you all!